This document was issued in Alexandria, Virginia to the vessel Polly H Nancy, which was under the command of John McKnight and had a carrying capacity of 350 tons (known as “burden”). The vessel was heading from Alexandria to Rotterdam with a cargo of tobacco, sugar and coffee. This early example of a sea letter/ship’s passport is in three languages: English; Dutch; and French. The later standard was four languages with the inclusion of Spanish within two years of the issuance of this document. 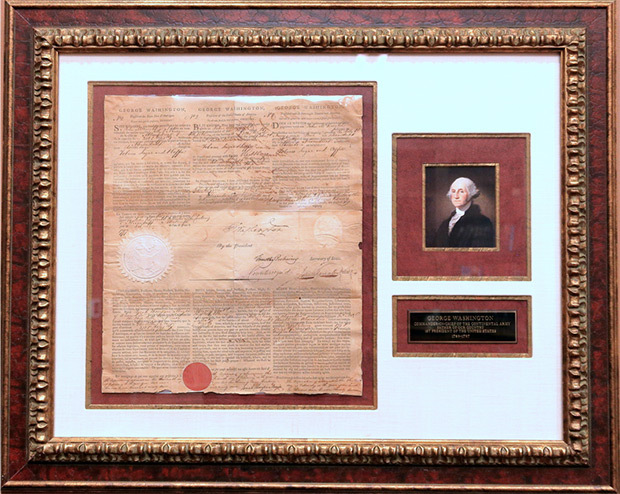 It is signed by President George Washington who served as the nation’s first President. He served two terms, from April 30, 1789 until March 4, 1797. This document is rare because it is also signed by Timothy Pickering who had been appointed Secretary of War in January 1795 and signed this document as “Secretary of War, Executing the Office of Secretary of State”. A scandal, much of which was fomented by the ambitious Timothy Pickering, had embroiled the Secretary of State Edmund Randolph who resigned on August 20, 1795, the day on which Pickering was appointed as ad interim Secretary of State. This document would indicate that suspicions that Randolph was corrupt or possibly treasonous were so strong prior to February 1795, that his authority as Secretary of State had been suspended and Pickering had assumed that authority. Pickering was elevated to the full position on December 10th of that year. The document is also signed by the Collector of Customs in Alexandria, John Fitzgerald, who had been aid-de-camp to General Washington during the Revolution. Col. Fitzgerald related a battle when Washington was out in front of his troops and the British and Americans took aim at each other. After a volley of musketry, Washington was unharmed and cheered his men in pursuit of the fleeing British. Col. Fitzgerald says he rode to Washington’s side and said, “’Thank god your Excellency is safe,’ and then wept like a child for joy.” It was this faithful comrade–in-arms who was appointed to the lucrative post of Collector of Customs on April 12, 1792. Also signing the document was Jonah Thompson who was the Mayor of Alexandria as well as being a prominent shipping merchant and President of the Bank of Alexandria later in his career. The document is printed on rag paper and bears the Great Seal of the United States in the right, center and other seals.